Yup, you read that right. Because before you can move forward, you gotta say goodbye. Old, dull, critical, stressed-out, small-time self? SEE YA! Because it’s time to put all that stuff in the PAST where it belongs – and instead jump ahead to the level you KNOW you are really meant to be at. You already have (almost) everything you need! Honestly you HAVE the guts, talents, and brains already to be at the top of your field. Now you just need to know how to present your business to the world to get “business famous” – to get clients coming to YOU because they’ve heard you’re the best. I can tell you first-hand that there is a way to leapfrog to the top of your game and get to that vision you’ve dreamed of with ease, grace, and even FUN! And I can tell you that straight-up because I’ve done it myself. And if it seems like I “came out of nowhere”, that is true. Honestly this has all happened REALLY fast for me. In January of 2009, I moved from Chicago out to Venice Beach in Los Angeles. I decided to take the move as a chance to start over, and in a kind of impulsive move I fired every last one of my web design clients! (Even the ONE client who paid me more per year than entire salary at my old job – they kept trying to get me back too, it took a LOT of willpower to let that one go.) I wanted to “burn the ships” and start fresh. At the time, I didn’t have much. I had a few hundred people following me on twitter, and I had an email list of a few hundred people I had met at networking events in Chicago. (Read: they didn’t even know about my new social media business!) But I started with what I had. I committed to starting a weekly newsletter, so that people would see my name in their inbox every week and receive a valuable tip from me. On February 12, 2009 I held my first ever free webinar. I had about 50 people live on the webinar and I was THRILLED! I ended up selling my first ever online program during that webinar and making close to $3,000. I realized that I was on to something, that if I could make this kind of money from one webinar I could grow an entire business with this model. By March, I was up to 2,547 followers on twitter with 50-100 hits per day to my website. And by the summer I had over 5,000 twitter followers, with an email list of just over 1,000 people to match. 2009 was the first year that I cracked the six-figure mark, from a business I had created from scratch that same year. Fast forward to today – I have a database of over 50,000 people and a team of five full time employees. I built all of this not on paid advertising, not on direct mail, not on going to networking events or killing myself flying all over the country to speak every weekend. I accomplished all of this by Creating Fame, using the same systems that I’m teaching to you today. I share this with you because I want you to know that this is all possible for you as well. You can go from scratch to multiple six figures in less than two years. Less than one year. The speed is up to you. And by building a devoted following, you do NOT need a list of 100,000 people or to publish a best-selling book, or be a regular on CNN. You can have an extremely profitable business that is not a complicated nightmare to run. All you need a small but devoted following that shares your blog posts, that sends you “thank you” cards in the mail, that fills up your schedule as soon as you make time available. That’s what Creating Fame is all about. Why climb a ladder when you can jump over a frog? I’ve never been much for ladder-climbing. That long, painful process of going slooowwwwwly rung by rung by rung, occasionally slipping down but never making a large leap forward. In fact, I probably should not be admitting this publicly but the truth is this – I never did small speaking gigs. The whole “ten people gathered in the bank’s back room” thing. Nope. Skipped right over it! I went straight for the big fish. The Social Communications Summit, South by Southwest Interactive, BlogHer, etc. This is what is called leapfrogging – it has been a huge factor in my success and will be in yours as well. Leapfrogging is the act of jumping to right where you want to be and skipping over all the useless junk most people think they “have” to do to get there. Here’s a paradox: this stuff can make you rich quick, yet it’s about as far as you can possibly get from “get rich quick”. Why is that? Creating Fame is all about creating a LEGACY in your field. I only work with smart entrepreneurs that are interested in building a long-term, trusted reputation. But here’s where you kinda get to have your cake and eat it too: even though we’re thinking long-term the results happen FAST. Like head spinningly-fast. You can make one well-targeted move and suddenly have 500 interested prospects. Did you see above where I built a list of over 50,000 highly-targeted, highly-engaged prospects in a few years? Some people never achieve that over the life of their business. But this is not about VOLUME, it’s about RELATIONSHIPS. Every person on that list feels like they have a relationship with me. What I teach brings in ONLY people who actively seek you out – then like you so much they decide they want to stick around and form a long-term, profitable relationship with you. There is ZERO ADVERTISING INVOLVED. This flips the traditional marketing relationship on its head. People don’t like being advertised to. People like being spoken to – you know, like people! Radical concept, right? You’re only talking to people who want to hear from you. You’re only selling them what they want to buy. You take yourself out of the feast-or-famine cycle of constantly hunting for work. I really cannot describe the impact this model will make on your business. It finally feels like you’re floating with the current instead of fighting to swim upstream. What Makes Creating Fame Different From Everything Else Out There? Video can be a great tool for creating fame – but what if you’re terrible on camera? Then video will absolutely backfire in positioning you as a poised, confident expert. But you might be excellent in audio recordings, or writing white papers. The point is we all have our strengths and my philosophy is to shine through your strengths rather than trying to fit yourself in some cookie cutter plan that isn’t right for you at all. I’ve seen other programs that say you must do video, you must do podcasting, you must do this and that. Sorry – but that is a short path for disaster. I’m going to show you how to discover which medium is a natural, easy fit for YOU then give you the tools to master that medium. One of my greatest strengths is making complex technical concepts easy to digest, easy to understand and (believe it or not) fun! No matter how much of a technophobe you are I promise that this program will not be over your head. You do not need to be an internet genius to create your fame. This program is accessible to anyone who wants to learn. Some people are obsessed with their list size and traffic count. Guess what? That is one of THE biggest fallacies out there. I would tell you that I have a LOT of twitter followers, but many of the “big players” out there consider my 25,000 followers pathetic! But wanna know what I know that they don’t? Basically it’s the difference between a room of 25,000 attentive listeners hanging on to your every word . . . or speaking to a room of 200,000 that are milling around, having side conversations, writing emails while you try desperately to shout over the din – HEY! LISTEN TO ME! LISTEN TO ME! Hmmm which sounds like a better, and more profitable crowd to you? I know which one has gotten results for me. Creating Fame is NOT Just About Getting Famous! OK this one might surprise you! Yes we all want to be known in our field. But this is about MORE than just being famous. Because the truth is fame and money are not always as closely tied as you might think. This is a system for putting you at the top in a way that picks up tons of targeted clients and customers. Really the focus is on providing you with a steady flow of highly targeted leads. Being well known in your field is just the method we’re taking for getting there. And This is NOT Just About The Money Either! Yes the financial success will come. But what is REALLY the point of getting famous? Sure it’s a nice little ego boost but there’s something bigger at play here – sharing what you do in order to help others. Sorry if that sounds hokey but really, we’re all here because we have something to contribute. Whether it’s beautiful design, healthy living, useful business tools or helping folks make breakthroughs in their personal lives. 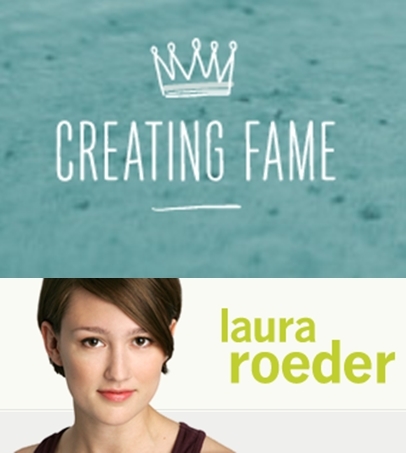 So What Exactly Is Creating Fame and What’s In It for You? Creating Fame is made up of an inspired group of passionate entrepreneurs who have one thing on their mind – raising quickly to the top of their field! You’ll have access to me, as well as the ability to tap into the hive mind for resources, advice and accountability. Within just two months, I’m going to walk you through the proven system for leveraging the web to create a publicity, traffic, and a lead-generating machine. If your current online hub (aka your website) is a disaster do not panic. I am not letting go of you until we turn your web presence into a lean, mean, fame-makin’ machine! And that is going to be MUCH easier than you think. Creating Fame is made up of four core video modules, with additional bonus materials to help you fully understand the concepts. Have a look at our curriculum page for more detail on exactly what’s covered in each of the four modules. One lesson is released per week over four weeks. But exactly HOW is Creating Fame going to make you well-known? Not just theory, but actually doing the work of becoming famous? You’re not learning this stuff so that you can feel smarter, you’re learning it to see a real change in your business! That’s why we follow every session of Creating Fame with Fame Camp. Fame Camp is the down n’ dirty step-by-step work of implementing all the major themes you learned in Creating Fame. Fame Camp also lasts four weeks, and happens right after Creating Fame. In Creating Fame you learn, and in Fame Camp you put that learning to work. Each Monday, you’ll receive an in-depth downloadable guide on that week’s topic, followed by daily email assignments. The pace is fast yet doable for a small business owner. There’s just one rule for Fame Camp: high-leverage activities only! Click here for more detail on each in our curriculum page. Creating Fame is NOT a “here’s a pile of info, good luck with that!” type of program. I expect that you’ll need to troubleshoot, ask questions, share your failures and successes, and just get a little boost of support along the way. This grants you full access to me, your course leader, as well as all of your smarty-pants peers going through Creating Fame right alongside you. Do you have enough time to make it to the top? If you’re thinking this program is going to take up too much of your time – what the heck DO you have time for if not making your business succeed?? YES this is going to take up some of your time – as all worthwhile things do. But please do not let this pass you by because you don’t think this is the “right time” or you aren’t willing to commit to just eight weeks. That was the attitude of the old you, seriously. And if I have to do it myself I will sit down with you and look at your schedule to decide when you can work in Creating Fame. It is that important to me that you succeed. So, if you want to work with me to build up your dream, brick by brick in an environment of fun, supportive, successful entrepreneurs – join me. It’s as simple as that. So What’s Your End of the Bargain? Here is where I’m supposed to compare the cost of this to other things you might spend your money on, but REALLY do I even need to? Back when I did consulting you could hire me for $5,000 per day. A marketing firm costs lord knows how much more. Or you could sink your money into advertising – where you have to pay for every single lead instead of the free fame “snowball effect” generated by Creating Fame. This is a no-brainer! And there’s something else important to point out about the price – all the techniques that I teach are free or cheap to implement. In some programs you’re paying to learn how to pay for more stuff – know what I mean? This is a system that is low or no cost to implement and will continue to support you in every project that you do in the future. Let’s get real – if you’re ready to put in the work to achieve your dream, you already know this is right for you. You’re reading this page, thinking that this sounds awesome. Thinking that you really should do something like this, that you really want to. And you’re totally going to think about it, and probably do it very soon. It’s what I tell myself when I’m going through yet another endless deliberation in my business – should I offer this? Start that program? Hire that person? Change my website? The truth is I could think about these things forever. But THINKING doesn’t get you anywhere. ACTION does. And the sooner the action (AKA now, AKA before you’re “ready”) the sooner the result. You’re ready to grow your business. You’re ready to make more money, have more time, do more of what you love. You’re ready to break free of the feast or famine cycle and have customers coming to you. You know these things today, without a moment’s hesitation. I don’t need to paint the picture of the struggles you’re having in your business now – you know them deeper than anyone. You know how it feels to not know where your next dollar is going to come from, how it feels to be overlooked, how it feels to have huge dreams that after all this time still haven’t come true. So stop already! Stop settling. Stop accepting less than you know you’re capable of. Stop letting ok be good enough. And start, start right now. TODAY is your day. This moment is your time to take a hold of something better.